In 2009, the Baiji (Yangtze River Dolphin) was officially declared “functionally extinct” by scientists with the International Union for Conservation of Nature (IUCN), as one of the oldest cetacean species on earth blinked out of existence. Now, with 2013 population estimates between 200-245 animals, the tiny vaquita porpoise, found only in a small area in the northern Gulf of California, between the states of Baja California and Sonora, Mexico, has become the world’s most critically endangered marine mammal species. In late 2009, a coalition of three nonprofit organizations, including the Monterey Bay Chapter of ACS, formed ¡Viva Vaquita! in an effort to catapult the vaquita into the international spotlight and promote a healthy marine ecosystem in the northern Gulf of California. ¡Viva Vaquita! aims to save the vaquita and providing long-term quality-of-life benefits to fishing communities and local residents of the Upper Gulf of California region. Photo by Christian Faesi, © Omar Vidal, Proyecto Vaquita, ITESM-Campus Guaymas, Sonora, Mexico. Unlike that of many imperiled species, the habitat of the vaquita remains clean and healthy. Their dramatic decline is attributed solely to by-catch in gill nets used to catch shrimp and fish, which kill more porpoises than are born. The nearly-invisible gill nets trap vaquitas, and they drown. If these nets can be moved out of the small area where vaquitas live, the species will likely recover. To this end, ¡Viva Vaquita! 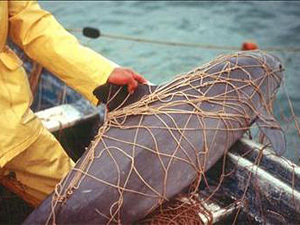 collaborators coordinate with the Mexican government and researchers to promote the development of alternative fishing gear that doesn’t harm vaquitas, and to reward and compensate fishermen for giving up gill net fishing in the vaquita’s range and embarking on economically viable and more environmentally sustainable livelihoods. The latter is achieved through various efforts, including the Mexican government’s fishing gear “buy-out” and “rent-out” programs, as well as small start-up loans for local business endeavors. In addition, ¡Viva Vaquita! has coordinated with research efforts by the world’s authorities on vaquita population dynamics and ecology in the United States and Mexico. As a result of these and other efforts, the first reliable population estimates have been recorded. Extinction is forever. 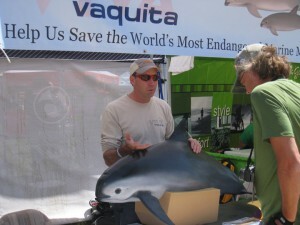 Visit the Monterey Bay Chapter and ¡Viva Vaquita! websites to learn how you can help!